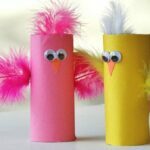 Cover cardboard tubes with pink and yellow construction paper. Cut small triangles from the orange construction paper for the beaks. Glue to the cardboard tube. Glue two goggly eyes at the top of the beak. Have a grown up poke a hole in both sides of the cardboard tube. Ad a dab of glue to the hole and insert feather. Add some glue to the inside of the cardboard tube above the eyes. Add a small feather to the glue. This project for Spring Craft: Cardboard Tube Birds was printed from CraftsbyAmanda.com - https://craftsbyamanda.com/spring-craft-cardboard-tube-birds/ and can only be printed for education or personal use.